Entries tagged with “World Vision”. A challenging story of how a successful Christian, CEO answered God’s calling reminds us that sometimes we have to do more than just sit in a pew. Rich Stearns, is the current President of World Vision and is well respected within the international development community. I had never heard his story before, but am amazed at how God worked in his life. only propose that genuine concern for “the least of these” that finds tangible expression must be woven into the pattern of their lives and faith. That expression might involve small but regular gifts to compassion ministries, advocating on behalf of the poor to government representatives, or regular volunteering at a soup kitchen, the local nursing home, or the Ronald McDonald House…. Even Jesus did not spend every waking hour helping the poor. He dined with the wealthy, celebrated at weddings and feasts, taught in the synagogue, and perhaps did a bit of carpentry. Still, there is no question that His love for the poor found consistent and concrete expression in His life and ministry. Yes, this book contains numbers and statistics that are overwhelming, even to me. But his focus is more on telling the story about how God redeems us and redeems our brothers and sisters around the world. Stearns will not allow you to get bogged down in the numbers, but will help you remember that each number represents a living person that Jesus died for. Pick it up, read it, discuss it, share it with a friend. Comments Off on Who Cares About AIDS? In the past few years I have written about HIV/AIDS quite a few times (see them here). But let’s be honest here for a few minutes. Who really cares? AIDS is a four letter word, that like so many others shouldn’t be spoken about in polite company. Do you even remember what the four letter’s stand for? Acquired Immunodeficiency Syndrome. Yea, that means nothing to me. When you spell it out like that, it makes even less sense. So what will actually make sense? We are very blessed that in the US, even though over a million people have HIV/AIDS (CDC), for many people it is managed through medication and is almost thought of as a type of cancer. But did you know that babies die from HIV/AIDS related infections or were you to busy protesting at an abortion clinic? You see, HIV/AIDS ravages your body so that something as simple as a winter sniffle could end up killing you. That is the simple version, but it makes sense. Why did the baby get HIV? Her mom gave it to her, more than likely. What kind of terrible mother would give her child HIV? Who knows, maybe she was raped by a stranger in the middle of the night. But does it matter how she got it? Only if you want to pass judgment. Why can’t we love someone without trying to pass judgment? Ok, so babies and children are dying because of no fault of their own. A quick question, if the entire population of Spain had HIV/AIDS do you think someone would care? What about the entire population of Texas? Well according to World Vision, that is the current estimate of how many people are currently suffering with this ailment. 40 million. By 2010, the number of children orphaned by the disease is expected to exceed 25 million — slightly more than the population of Texas — according to the United Nations. The impact on these children, both before and after the deaths of their parents, is catastrophic. A few days ago was Black Friday. Did you go waste your money on earthly materials that do nothing but provide five minutes of happiness to your child before being thrown in the bin with last year’s? This year a Walmart employee was “trampled to death” by shoppers eager to purchase the latest craze. This is truly a sad state of affairs. As a culture we are willing to trample over fellow Americans to purchase a blender. I guess it should be no surprise to me that no one cares about babies dying in a foreign land. All of this makes me angry and sad. But I am thankful for the organizations, churches, and individuals who are willing to stand up today and throw off the chains of injustice and care for the orphaned child and suffering widow. These are our brothers and sisters and they deserve our love and admiration. James 14-17 Dear friends, do you think you’ll get anywhere in this if you learn all the right words but never do anything? Does merely talking about faith indicate that a person really has it? For instance, you come upon an old friend dressed in rags and half-starved and say, “Good morning, friend! Be clothed in Christ! Be filled with the Holy Spirit!” and walk off without providing so much as a coat or a cup of soup—where does that get you? Isn’t it obvious that God-talk without God-acts is outrageous nonsense? Will you sit idly by or will you act today? Speak out for AIDS-affected children. Urge Congress to continue and increase the U.S. contribution to the global HIV and AIDS battle and ensure that AIDS-affected children are not forgotten. Visit the “World Vision Experience: AIDS” in a city near you. Sponsor a HopeChild in an AIDS-affected nation. I can’t say how thankful I am for everyone of you who supported me through the marathon and especially through my fundraising efforts for Team World Vision. It was a humbling honor to run on behalf of my African friends and to share their stories with you over the last months. It really has been fun to combine two of my passions into such a powerful event. Thank you! I am excited to announce that as of writing this post, we have raised $2,086 for Team World Vision!!! This exceeded the $2,000 goal!! Thank you!! That pretty much sums up Team World Vision. I’m not sure when/if they actually close down the fundraising page, but you still have the opportunity to give today. Thank you!! If you didn’t know today is Blog Action Day around the world!!! Working for an inner-city school with a large immigrant population – trying to find ways to enhance the learning environment and educational experiences for 400 kids. We haven’t done this in awhile, but shopping at a Goodwill or Salvation Army store gives you some great deals while supporting their job training programs. This is just a start… what are you doing to end poverty? Here is a list of 88 Ways to Do Something About Poverty. Comments Off on Final Marathon Update! It has been almost a week since I finished my first marathon!!! Yes I made it the entire 26.2 miles! It was quite an adventure as the rain pelted down on us for at least 4-5 miles of the race. But it was very thrilling to reach the finish line and to know that I had accomplished such a large feat. My finish time was 3:25. My Dad asked, “What does that mean? Is that fast, slow, really fast or what?” He’s not a runner so that’s understandable. Most of my running friends know what that means – I finished in the top 10% of all the finisher’s in Sunday’s race. I didn’t quite make the “gold standard” of a Boston Qualifying time, but for my first marathon I am quite pleased with the effort! I have already posted two reviews of the race, so I would encourage you to check them out. The first is Grading the Race Plan and the second is a more traditional Race Review. On a similar note I am very excited to say that we have surpassed our $2,000 goal for Team World Vision!! Isn’t that awesome. So thank you to the many of you that donated and supported this effort. It was a pretty amazing and overwhelming feeling to know that my running a marathon changed my life, but also lives of children and families in Africa. Thank you for being a part of the journey with me. There is nothing more important than having a passion that drives you. You probably know that two of my passions are running and Africa (if you didn’t know you do now!). I have decided to bring these two passions together to create something exciting and hopefully powerful and life changing. Read on to learn more! A few years ago while lining up for the Indianapolis Mini-Marathon, I noticed a guy wearing a bright orange jersey with the World Vision logo all over it and the words “Team World Vision”. I found that quite interesting, but didn’t really have time to talk with him before the race started. When I got home I did some research and found out that World Vision has a fund raising program where individuals join the Team, raising money while competing in an athletic event. Since then I have thought about when would be a good time to join Team World Vision and combine running and Africa. When I started thinking about running my first marathon, I decided this would be the time. 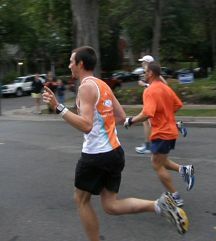 I will be running the Twin Cities Marathon, here in Minneapolis on October 5, 2008. I am about halfway through the training and it is going really well. Christy and I decided that this would be a good time to raise money for World Vision in honor of our friends across Africa. We set a goal of raising $2,000, which is roughly $76 per mile! My goal for the marathon is to cover the 26.2 mile distance in 3 hours and 10 minutes. Thank you for your friendship and your ongoing support! Adventures and Thoughts of Team Cross is powered by	WordPress 4.3.19 and delivered to you in 0.450 seconds using 36 queries.